Our Catalina Box Top Pocket 1000 Divan Set by Airsprung features our Catalina Box Top Pocket 1000 Mattress on top of a matching Divan Base that has handy storage options available which help to maximise the space that you have in your bedroom. The Catalina Box Top Mattress by Airsprung contains up to 1000 (based on a King Size) 15.5 gauge pocketed springs beneath 750mm of softer rich layers of white filling adding another layer of comfort to this supportive mattress. 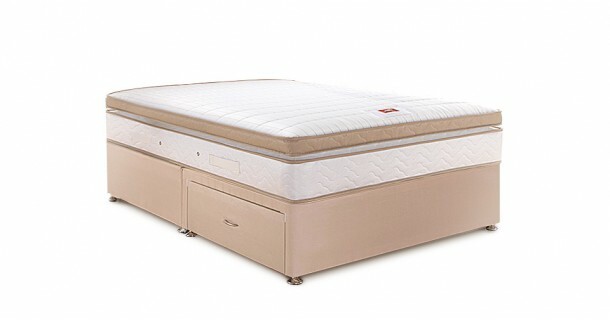 The 1000 individual pocket springs within this mattress which individually adjust with perfect precision to your body’s movements as you turn. Combined with a luxury box top of rich layers of soft white filling ensure that this high end mattress is both comfortable and a very well supported sleeping surface. The Catalina Mattress is a wonderful design of fine Belgian damask, with the sleeping surface of the mattress being finished with traditional tufting and neat straight line stitching. The flag stitched handles make it easy to move and combined with the four air vents makes the mattress have an air of luxury. The Catalina Box Top Mattress by Airsprung is of a medium firmness rating. This would make an ideal choice of mattress for those who prefer the comfort and support that a standard medium mattress has to offer. This wonderful Airsprung mattress ensures that a firm and supportive sleep doesn’t mean you have to compromise on comfort. Using well designed technology and a box top makes this mattress have that luxury feel. Please quote this Products's code 02130DS to speed up your query if related. by Airsprung features our Catalina Box Top Pocket 1000 Mattress on top of a matching Divan Base that has handy storage options available which help to maximise the space that you have in your bedroom.